Sketch of a Pioneer Who Has Lived in Franklin County for Eighty Years. Sketch of a Pioneer Who Has Lived in Franklin County for Eighty Years. He Has an Interesting Fund of Knowledge Concerning Persons and Events of Earlier Days. The writer believes if you have bouquets to shower on friends, do so while they are living. Allison B. Cummins, residing near Lock Chapel, on Templeton's Creek, was born October 22, 1824, and he celebrated his eightieth anniversary of his birth on October 22, 1904. He is the last surviving member of John and Anna (Smolley) Cummins. John Cummins was a native of Westmoreland County, Pennsylvania, who came down the Ohio River in a flat boat and landed at Cincinnati in 1816, when that city was not larger than Brookville. At that early period there was but one wagon road leading into Cincinnati, and it was cut through a bluff on a hill from Main street. The elder Cummins remained in the Queen City long enough to purchase a wagon and team to convey himself and little family to the Indiana wilderness, over roads that were almost impassable, locating in Springfield township, where he built a log cabin on the farm now owned by James Witt, north of the Big Cedar Baptist Church. The John Cummins family consisted of three daughters, Lucinda, Mary and Margaret, and two sons, john and William. Allison Bunnell Cummins, the subject of this sketch, is the last member living of the original Cummins family. His sisters, Mary, Martha and Elizabeth, along with Thomas, a younger brother, have passed to that bourne from whence no traveler returns. The advantages for obtaining an education in pioneer days were limited, subscription schools running only about three months during the winter, in log cabins having an eight foot fireplace, affording apt students to graduate when they passed the Single Rule of Threes. Mr. Cummins assisted his father in the clearing and other farm work nine months of the year, and improved his golden opportunities in mastering the mystery of the Three R's during the cold winter months at the old school house. He obtained a fair education, and learned to write a hood hand with a goose quill pen. 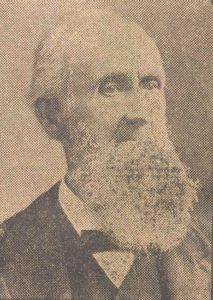 Upon arriving at maturity he conceived the idea of getting married, and having established a character for honesty, sobriety and industry, had no difficulty or rivals in obtaining the consent of Miss Angeline, daughter of Riley and Keturah Woodworth, to change her name to Cummins. Their marriage proved a happy one. Their children are Amaretta L., who became the wife of Amos Gire, Anna, the second daughter, married George Everett, Ella became the better half of John Everett, deceased, and later formed a life trust with Frank N. Bouwell, while Miss Minnie, the youngest daughter, is the companion at home of her aged father and widowed sister, Mrs. Ella Everett. Mrs. A.B. Cummins died June 8, 1883. She was a good mother and an affectionate wife, and her death was regretted by all who knew her. Mr. Cummins has been a continuous resident of Franklin County for a period of eighty years. His occupation has been that of a farmer. For twelve years he was afflicted with stomach trouble but by being careful in his diet, entirely recovered and at this writing he is enjoying splendid health for an octogenarian. When 11 years old the father of Mr. A.B. Cummins moved to a farm three miles south of Brookville, known in early days as the "company mill", where the father and son carried on farming and run the water mill which ground wheat and corn on French buhr stones. Farmers came for miles on horseback with their grain and awaited their turn while the grist was being ground. In those days people were content with corn dodger and their 6 o'clock dinner consisted of one course, mush and milk. Mr. Cummins recollects when the first survey was made for the Whitewater Canal in the year 1834. The citizens of Brookville and surrounding country came for miles to participate in the jollification meeting held in a cluster of sycamore trees located where the basin now is. General Long was the orator of the day and he spoke in eulogistic language of the advantages of this internal improvement. Before the ceremonies closed the General pulled off his coat and ran the first wheelbarrow of dirt for the fill opposite Uncle George Schlapp's place, formerly known as the "Oregon Hotel," amid the applause of the assembled multitude. General Long was a graduate of West Point and the chief engineer of the Whitewater canal. He was the inventor of the "Long Truss" and architect of the old "White" bridge that spans the East Fork, south of Brookville, perhaps the oldest bridge in the State. It has undergone some changes since it was erected in 1835, but it has withstood the storms of sixty-nine winters and is O.K. for strength. Mr. Cummins was present when the first canal boat arrived at the lock. It was named the "Ben Franklin". Great crowds came to witness the event. On its arrival a cannon was fired from the hill near the site of Catholic Church, flags were unfurled and a few old topers got drunk by pouring spirits down to keep their spirits up, for whisky only cost 12 ½ cts a gallon. Our pioneer friend has a clear memory and is a good conversationalist besides having a good name. He told us of the "Old Yellow Tavern" that stood south of the Public Square near site of County Jail. When the farmers came to town they had their choice, to assuage their thirst at the tavern bar or at the public well, south of the Court House near the present location of the fountain that was one hundred feet deep. The water was brought to the surface by means of a wooden pump. This was a dug well and walled with stone. In time it caved in and in after years was filled up. He remembers the old log jail, where offenders were boarded at the public expense, the same as now. The logs were dovetailed at the corners, "notched down", the inside walls being lined with sheet iron. He has a vivid knowledge of the first Court House, its judges and attorneys, and was personally acquainted with many professional jurors who returned verdicts. The old Market House in early days was a business place to sell and buy commodities. The Town Hall was built on the site of the Market House, the coldest spot in town. Mr. Cummins cast his first vote for General Zachary Taylor, the hero of the Mexican war, and affiliated with the extinct Whig party until the year 1856, when the Republican Party was born. He has cast his right of suffrage for all nominees of his party to the present date and on Nov. 8, 1904, cast one more ballot for "Teddy", the hero of San Juan Hill.